A picturebook a week: Dinosaur Roar! It is twenty years since Dinosaur Roar! first hit the shelves and Doubleday are celebrating with a beautiful hardback anniversary edition, published in association with the National History Museum. It is not difficult to see where this picturebook’s enduring success lies: a short rhythmic text full of repetition and a focus on a subject which has perpetual appeal for young children: dinosaurs. And it is indeed dinosaur galore, with all shapes and sizes, colours and levels of fierceness. 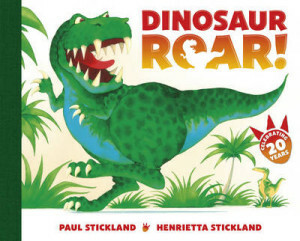 Here there are no complicated dinosaur names but the pure joy of playful text and zany illustrations. Each double-spread is brimful of detail to pore over, which will instigate many discussions between adult and child, while the text introduces the concept of opposites with much glee. The simplified yet perfectly pitched text and those vibrant silly dinosaurs come together to create a perfect specimen of preschool picturebooks. In fact, my children, many years later, still remember the text, which shows what a lasting impact a perfectly formed picturebook can have. It is little wonder therefore that Dinosaur Roar! has become a preschool classic. Here’s to another twenty years of success and countless read-alouds!